If you have old pictures, facts, records, and any other interesting items that can be added to our family tree information, please email them to me, bowesl@yahoo.com. Pass this page address on to any of our extended family!! 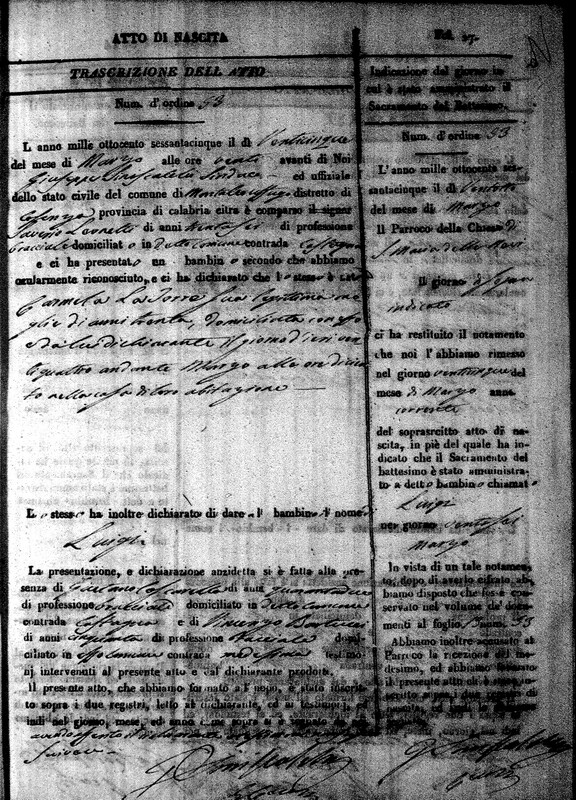 Saverio Leonetti, aged 36 on March 25, 1865. Saverio lived in the contrada (hamlet) of Castagna. and was his legitimate wife living in the same home. and Vincenzo Bartucci aged 50. Montalto Uffugo has many sections, villiages and hamlets. At one time, some may have been their own towns. The town was one of the first to section off the town as a whole and separate the industrial area from the rest of the town. On the outskirts of the town center are the farming areas like Parantoro, Vaccarizzo, Santa Maria La Castagna (formerly known as just Castagna) and Coretto. Montalto Uffugo is located in Cosenza Province in the northern portion of Calabria. Surrounded by mountains, Montalto Uffugo is fairly large by village standards. It is the second largest city in Cosenza Province. Chiesa della Madonna delle Neve (Church) The building has three naves, is in the hamlet of Santa Maria La Castagna. The facade has a portal with a simple coat of arms surmounted by a window. I am sure there are more but that is all I found for now. Sadly, I think we will come to a permanent dead end on the Leonetti line with Luigi's father. 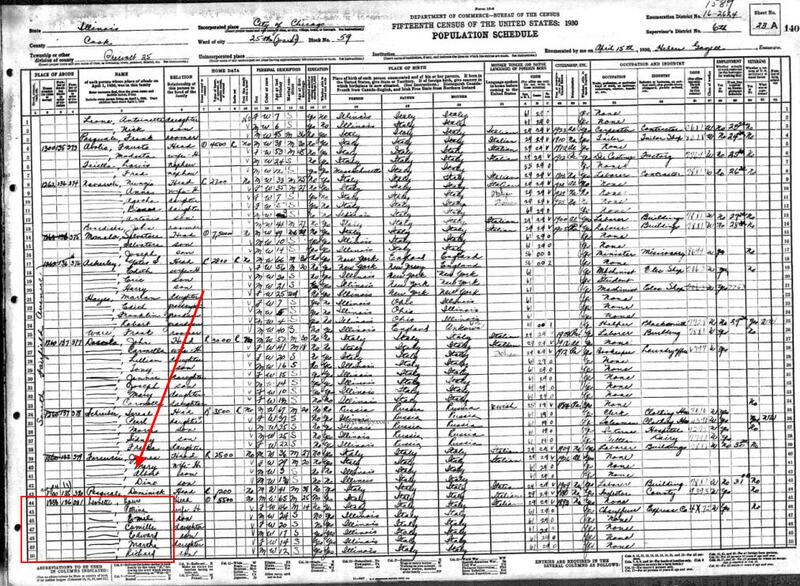 His birth name may have been Esposito...that means Saverio was an orphan and the Leonetti was added later - probably after his adoption. They married in 1855 so I will look for the marriage act to prove that. On the LaTorre side we should be able to find more. 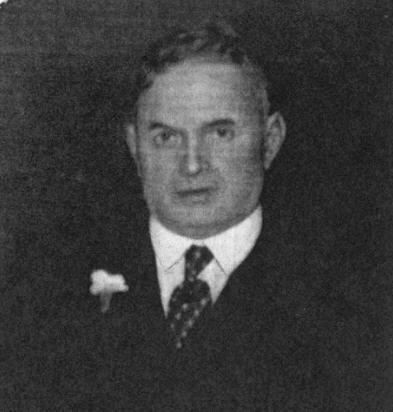 Thee Alderman's Wars is a term used to describe the series of murders and violent rioting between warring Alderman Johnny "de Pow" Powers and Anthony D'Andrea from 1916 until 1921. 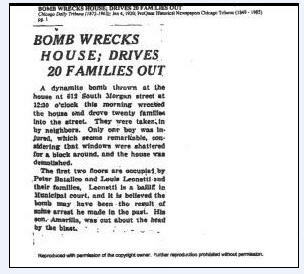 Over a period of five years, over 30 deaths were reported during the struggle for control over the "Bloody" 19th Ward of Chicago's Little Italy..
A dynamite bomb thrown at the house at 612 South Morgan Street at 12:30 o'clock this morning wrecked the house and drove 20 families into the street. They were taken in by neighbors. Only one boy was injured, which seems remarkable, considering that windows were shattered for a block around, and the house was demolished. The first two floors are occupied by Peter Batallco and Louis Leonetti and their families. Leonetti is a baliff in municipal court, and it is believed the bomb may have been a result of some arrest he made in the past. His son, Amerilla, was cut above the head by the blast. The bomb explosions which in the last week have endangered the lives of two Italian Democratic leaders in the Nineteenth ward were attributed last night by Ald. Johnny Powers to recent strife between Democrats and Republicans. Early on Sunday morning the residence of Representative Charles Cola at 817 Forquer Street was partially wrecked. The Black Hand was blamed. A week ago Louis Leonetti of 612 South Morgan Street, a friend of Cola, was blown out of his bed by a bomb. This incident was classed as “mysterious”. Investigation last night revealed that there have been recent “flare-ups” between Italian factions of both parties. “It seems to me to be a case of politics”, said Ald. Powers. “Italian Republicans and Democrats have not been on good terms and may be that the bomb play has been injected for revenge”. Representative Cola denied he was a target in the bomb explosion. He also denied knowledge of any political strife. Leonetti, a municipal court bailiff, admitted political friendship with Cola, but denied any partisan feuds. Please help support this page and keep it ad-free! !